For over 38 years, Lynda has worked in the financial services industry. She collaborates with her team to provide a superior level of service and ensuring that her clients feel valued through their relationship with Seacoast Investment Services. 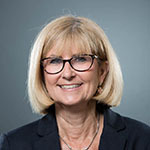 Prior to joining Seacoast Investment Services in 2007, Lynda worked at Wachovia Bank for 10 years, where she was an integral member of the Private Client Group. Throughout her career, Lynda has strived to provide the perfect client experience. Lynda graduated from Memphis State (now the University of Memphis – Go Tigers!) with a BS in Education. She and her husband Greg reside in Vero Beach where they are strong advocates for the Youth Guidance Mentoring Program, enjoy boating and spending time at the beach with their Shih Tzu rescue, Ms. Mya.